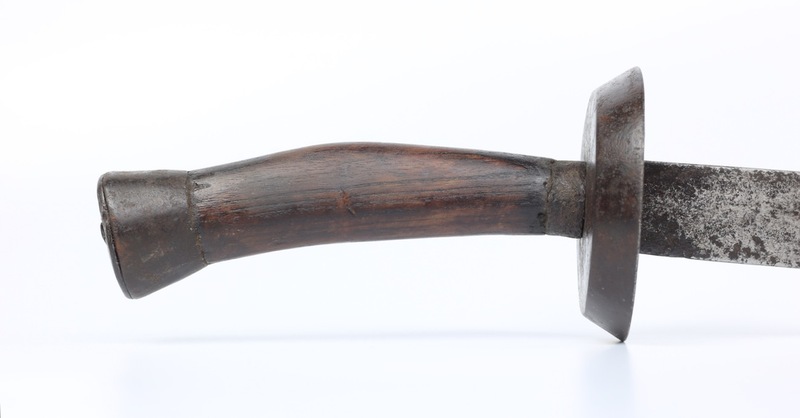 The niuweidao or "oxtail saber" was developed somewhere around the mid 19th century. It's characteristic blade flattens and widens considerably near the center of percussion, creating a fairly thin edge on a sweeping arc; perfect for deep cuts against soft, unarmored targets. This specialized design made the niuweidao immensely popular among rebels and their enemies in the social unrest that lead to the fall of the Qing, and the chaos that ensued in the Warlord Period of the early 20th century. 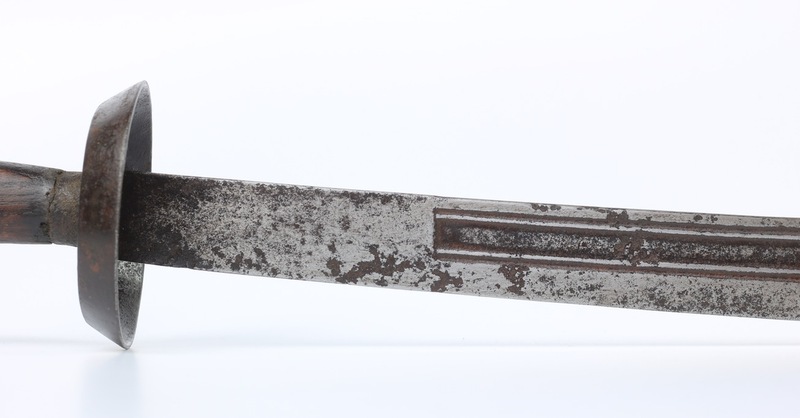 By the end of the last century, floppy martial arts swords of the same profile featured prominently in martial arts practice and movies, settling the niuweidao in the mids of many as the archetypical Chinese saber. 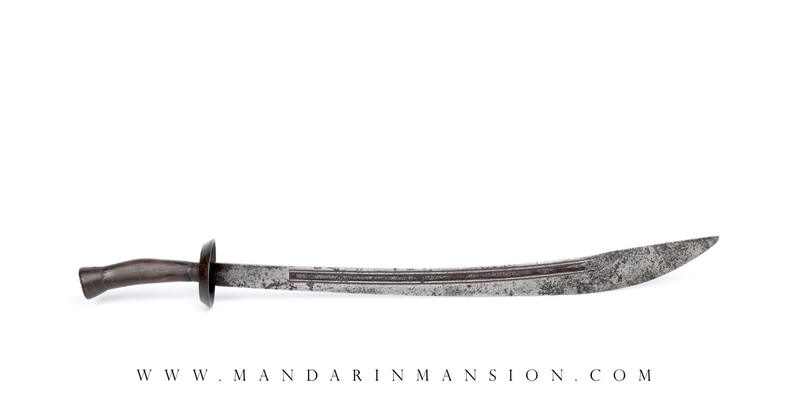 A classic niuweidao (牛尾刀) or "oxtail saber" with large blade that is thick at the forte but narrows considerably as it widens near the tip. This is to give structure to the deep arc at the end that is made to slash through soft targets, like the thick padded jackets that were worn in the north. The blade has an interesting groove combination that seems inspired by earlier military sabers. 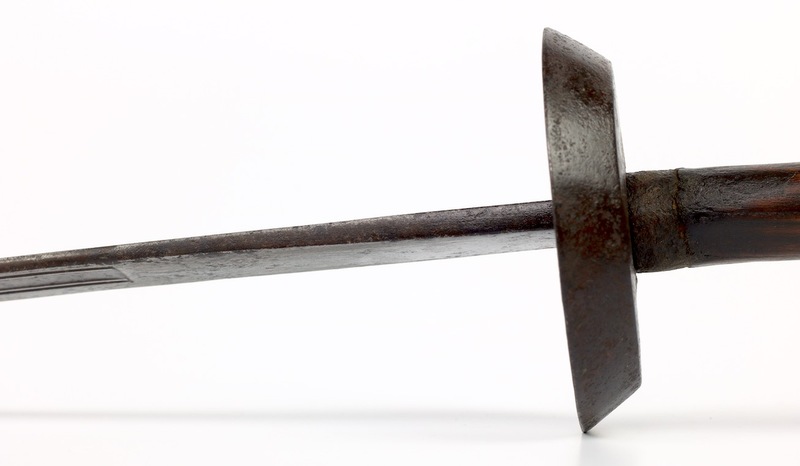 It consists of a deep groove flanked by two narrow grooves that start some 13cm up the forte and fade into the tip. The spine starts flat but turns round wher ethe fore starts, a transition common on niuweidao . It's not in polish so the details of its construction remain obscured, but it is most likely of forge folded construction with inserted high-carbon edge. They all tend to be. 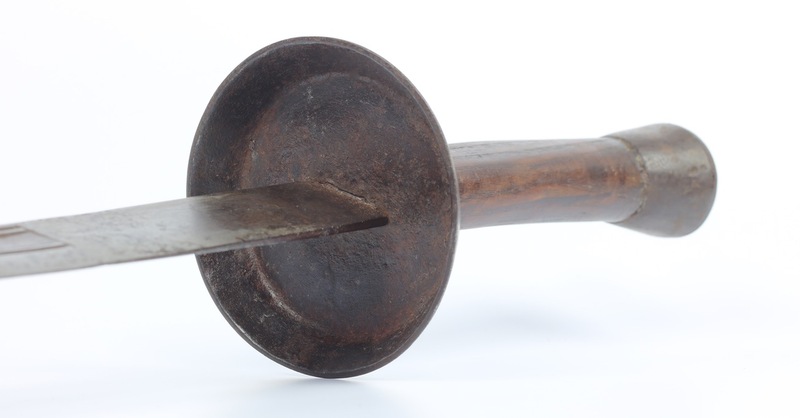 The hilt consists of a large forged iron disc guard with angled flange. 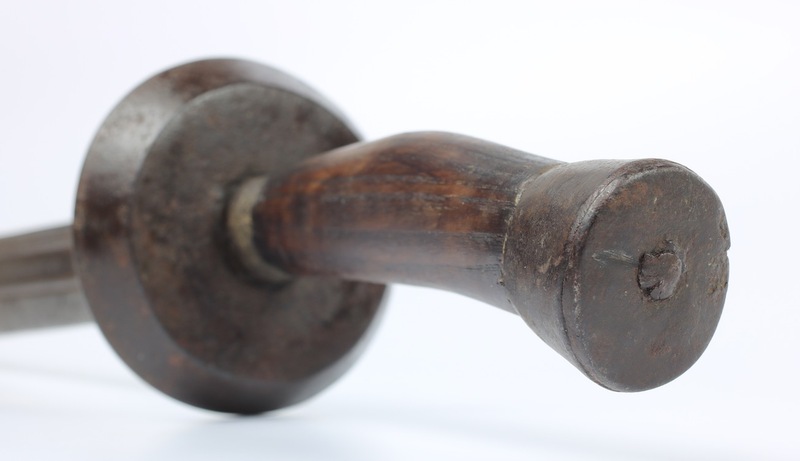 The heavy pommel, also forged of thick iron, is made with a separate plate. 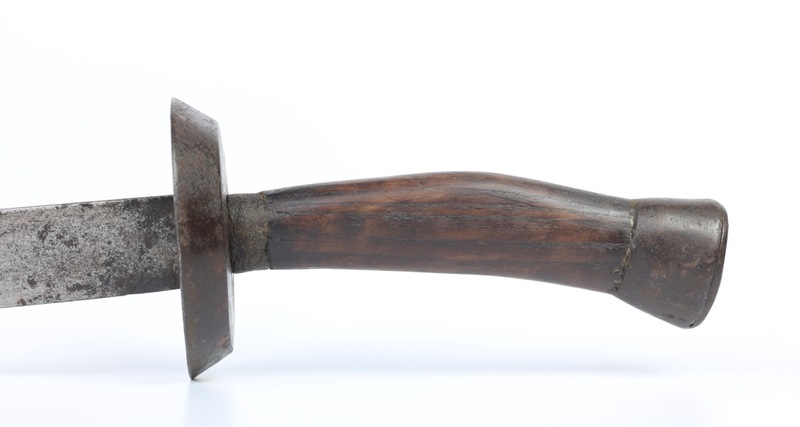 On the left side of the wooden handle is a small burned mark with the character 潘 ( pān ), a Chinese surname and quite possibly a reference to an early owner of the piece. 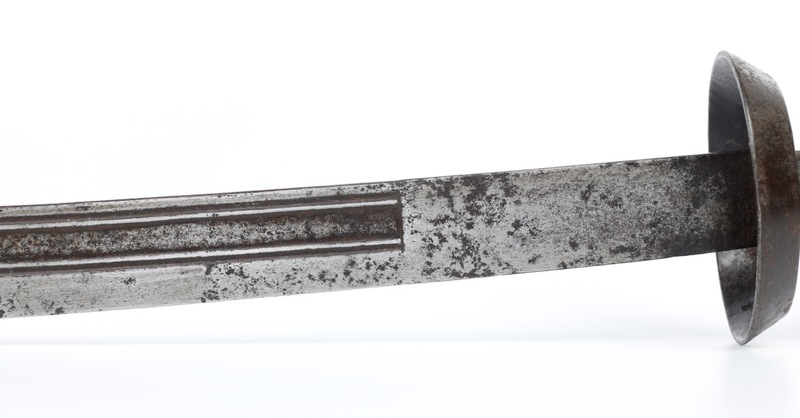 It was initially pretty well made for these, with good geometry on the iron fittings -a deluxe material at the time, favored over brass- and precisely cut grooves on the blade. Unfortunately the blade has seen better days, it's pitted and has some edge damage in the form of several nicks from another weapon. It has a very lively balance for one of these, and would do well as a practice saber for a martial artist. Restoration included refurbishing the hilt to get it tight again for exactly this purpose. When the saber came to me, the handle was in bad shape and painted mint-green. 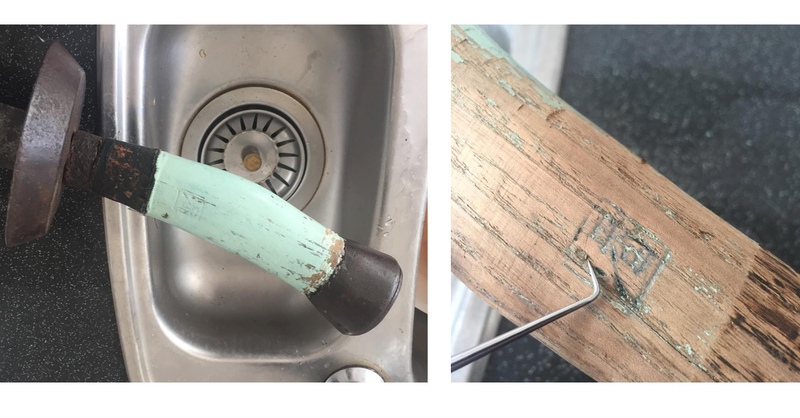 There was also a hole in the handle and loss of wood inside due to rotting. I removed the paint, treated the handle and filled up the lost wood. All restorations are practically invisible. Left: The choice of color can perhaps best be described as "interesting". Right: The character 潘 ( pān as seen as I was removing the modern paint. 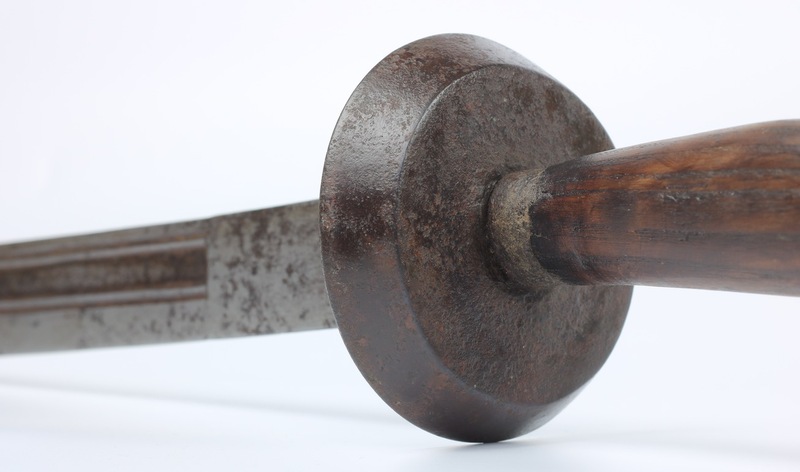 A classic example of an iron mounted oxtail saber of the 19th century with hand forged iron hilt mounts. It was of quality manufacture for one of these, but today the blade is not in the best shape. It is priced accordingly.